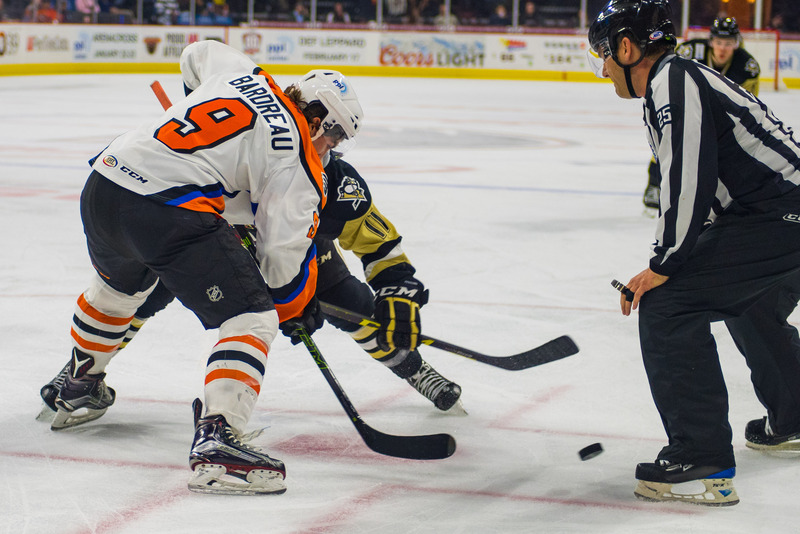 The Phantoms took 5 of 6 possible points in last weekend’s 3/3, and they’ll try to do it again this weekend. It’s another 3/3 with Hartford (AHL Rangers) in town tonight, Utica tomorrow, then road to Hartford again on Sunday. But it wasn’t easy last weekend. 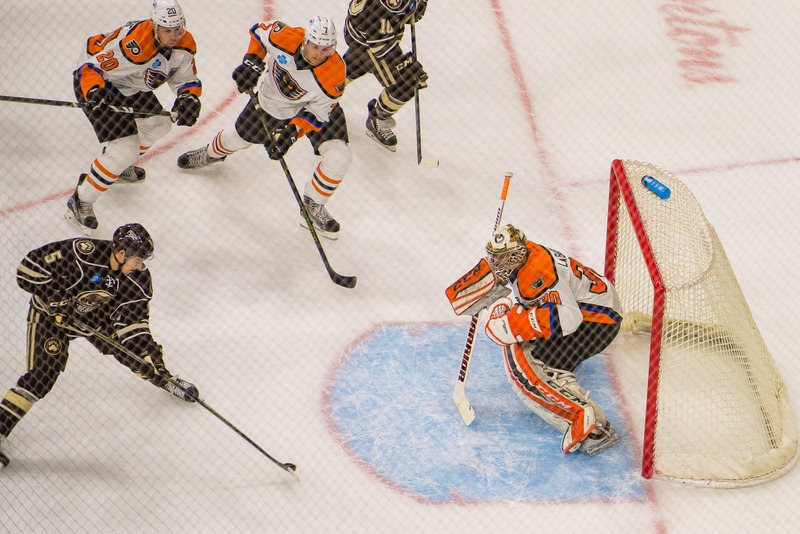 They had to cling to a 1-goal lead to beat last-place Springfield on Friday night at the PPL Center. 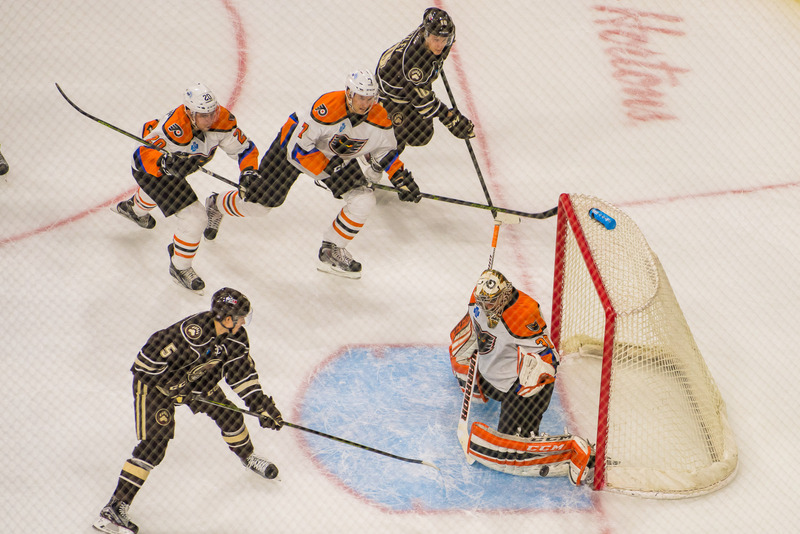 The following night, in an important standings match-up, the Phantoms came from two goals behind with 8 minutes left in the game, to tie–also at the PPL Center. Alas, they lost in the shootout, but only sacrificed one standings point. On Sunday, they headed up the pike to Springfield for a rematch against the cellar-dwellers. Once again, they found themselves down by two goals in the third period. Goals by Comrie and DiSimone tied it up, and a Mark Alt game-winner hit the inside of the net with three seconds left in the game! The Phantoms also got a power play goal from Cole Bardreau to lead off the scoring, and an important last minute goal in the second period from Tyrell Goulbourne. Stolie got the win in net, having played all three games over the weekend. In the official Horn and Bell Common Sense Playoff Predictor, the Phantoms started last weekend needing 19-5-1 over the final 25 games for a reasonable shot at the playoffs. After going 2-0-(-0)-1 on the weekend, our task now stands at 17-5 over the final 22 games. The “common sense” part is assuming the teams above us in the standings maintain a similar winning percentage over their final games. Portland, Providence, Bridgeport and Hartford are all ahead of us and within striking distance. Certainly, they’ll play each other a certain amount of the time, and our aim would then be for one of them to win, and generate only 2 standings points for the game. A regulation tie would allow both teams to gain standings points, as three will be doled out–one to the loser and two to the winner. That will make them both harder to catch. This also means, in any games by these teams against or rivals Hershey and Wilkes Barre, that we cheer for our Pennsylvania neighbors. They are firmly in the top two spots in the standings and since we’ll never catch them, they may as well help us knock off those teams in the next tier. I know d.E.’s eyes are glazing over just about now, as he’s getting ready to make a strong comment on how unlikely this all is. But, you know, a fair few years ago a rag-tag bunch of guys wearing red, white and blue took down the mightiest hockey machine in the world up in Lake Placid, NY. The unlikely sometimes happens, so we’ll continue to count this down until we’re eliminated (or for all intents and purposes). Don’t worry, I’m sure we’ll be the first one to “call it” right here. In conclusion, we need to win games. Other teams need to lose games, but that’s irrelevant if we don’t win ours. Two games against Hartford this weekend are the most important right now. Any points we can get versus Utica will be a help. F Colin McDonald missed all three games last weekend. He practiced fully and one would think that would mean he’d be back this weekend. One has to be careful. He practiced last week, too. Of course, we don’t know the nature of the “nagging injury” so there’s no way to be able to predict his availability based on medical knowledge. Even though the team did well without the captain last weekend, we’re going to need him more against better competition starting tonight. G Jason LaBarbera could have been nicked up a bit. He acted as backup for all three games last weekend, so he was available, but it was also unusual for Stolie to have to play the 3/3 by himself. No official word on Barbs status for this weekend, but I’d think he’ll get at least one game–and if it’s only one, then tomorrow versus Utica makes the most sense. F Michael Parks hasn’t played since getting crushed in Wilkes Barre in the early days of the season. What I’m assuming was a busted up shoulder was healing and rehabbing, but latest conjecture is that he may need season-ending surgery to clean things up. F Dalton Smith was signed to a ‘PTO’ earlier this week. Phantoms’ beat writers, on Twitter after the signing, see him as a nice addition to the bottom six for the Phantoms. Smith’s detractors say it’s a nepotism signing (Dalton’s father Derrick, and Uncle Keith Primeau played for the Flyers) of a guy who generates too many penalty minutes. We’ll see, I guess. He’s wearing #26. F Pavel Padakin is still with the team. However, Twitter discussions with the beat writers leads me to believe the rookie may be better served centering a top line in Reading and getting ice time in front of the net, rather than digging through the corners for 7 minutes in Allentown. We’ll see here, too. F Kevin Sundher skated in practice on Wednesday. His availability is unknown, although the current thinking is maybe next weekend. The Royals split a home-and-home with first-place Manchester last weekend, with the visiting team taking each game. This weekend the Royals begin a 3/3 on the road in Elmira, before heading to Adirondack for two on Saturday and Sunday. Important games as the Royals are sandwiched between Elmira and Adirondack in the standings. If the playoffs started yesterday, the Royals would be the seventh seed in the East, and face off against the Florida Everblades in the first round of the playoffs. The Hartford WolfPack come to town. We’ll see them again in Connecticut on Sunday. Former US National Development Team and first round pick, defenseman Brady Skjei, was assigned back to Hartford from New York earlier in the week–just in time for these games. Last 3: Hartford got beat by Portland on Wednesday, and split with the cellar Binghamton and Springfield last weekend for 1-2 in three. Last 10: 5-5. The Wolf Pack are a .500 team lately. Tickets, Parking and Security: Good seats are still available for this game, including the section 201 discounted seats. Parking and Security have been running smoothly of late, by my observation. If available, buy a pre-paid parking pass for the arena garage HERE. Broadcast Information: TV-2 if you have Service Electric; AHL-Live if you have unlimited money; AM-1470 on the radio; IHeartRadio App on your phone; PhantomsHockey.com on your computer; FM 89.9 if you bring your radio to the game (no buffer, real time). Pre-Game: TV goes live at 6:30PM from Chickie’s and Pete’s. Radio goes on at 6:20PM for your drive downtown. Pre-game on Saturday took Dan and me to Hijinx brewery just off of the MLK. It was jammed, so we wandered through the complex and sampled some newly released Bourbon from County Seat–housed in the same complex. We had a nice tasting, but decided to head for the more comfortable surroundings of grain. As always, good food and service there–we sat at the bar–and very fair prices. Check out the pork belly tacos if you go! Watch to see if LaBarbera plays tonight, or how he moves in net during warm-ups–if we might see him tomorrow. Watch to see the new guy Smith #26. How does he play? Is he effective? Can he stay out of the box? We have enough forwards. Watch to see if we stay 12F/6D or if we revert to 11F/7D, which we’ve used a ton this season for a variety of reasons. Watch to see if the Captain, Colin McDonald, plays. The Phantoms 13th ranked Power Play will face off against the Wolf Pack’s 20th ranked Road Penalty Kill; The Phantoms 16th ranked Kill Unit will defend against Hartford’s 30th ranked Power Play. Strax has been quiet lately. Look for Petr to get on the board with a goal tonight. Tomorrow is meLVin’s birthday! The Comets will return to town without their best player, and many, many other mascots will be in the house to help meLVin celebrate. Will the Comets bring their mascot? Will they bring the Comettes? Probably not, but expect to see Ferrous and FeFe, as well as the Phanatic and Coco from Hershey and Tux from Wilkes Barre–if history holds. Some college mascots could be in the house as well! It’s a great night to bring the kids! 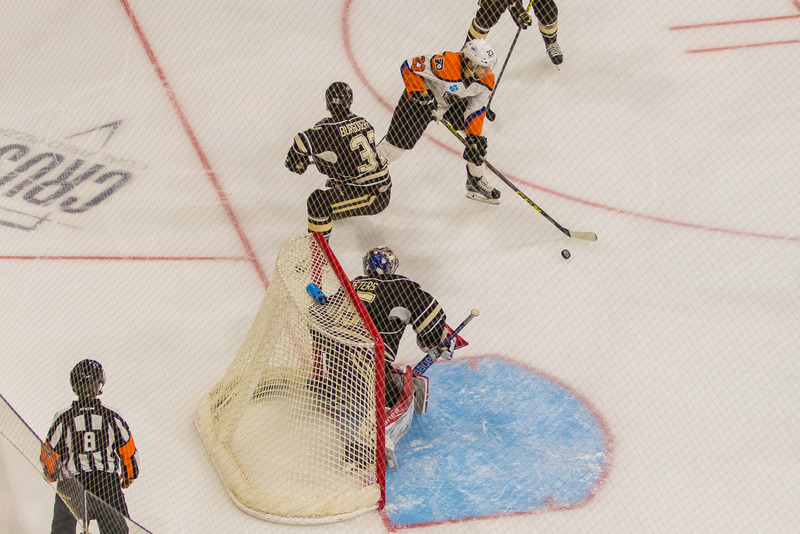 Sunday, the Phantoms head out on the road to complete the 3/3 up in Hartford. Wednesday they’ll be in Syracuse before returning home next Friday for the Penguins–and the jersey auction I’ve been waiting so long for. Look for jersey-related posts and news, coming up. NEXT Saturday is the SteelHawks Kickoff Classic at the arena, and I believe there’s also a Phantoms “viewing party” for the Phan Club at Melt (they’ll be in Binghamton). NEXT Sunday is the Phantoms STH Carnival at the arena. Most STH who have completed their renewals for next season have received their tickets via email. If not, call your ticket rep. More news on the carnival, forthcoming, as well.